by Adam L Silvermanat2:59 pm on January 23, 2019 . It has 209 Comments. To follow on BettyC’s post from earlier today, the only way the President, or anyone else for that matter, makes a joint address to Congress is if both chambers pass a joint concurrent resolution inviting that person to do so. 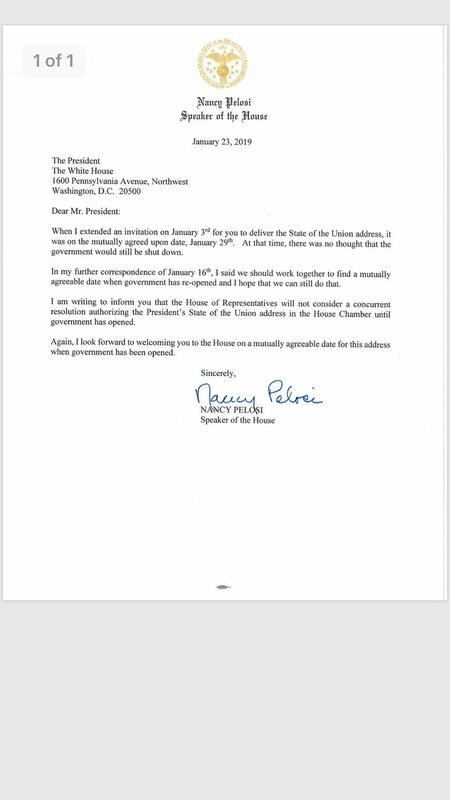 Speaker Pelosi has now made it abundantly clear that until the partial shutdown is ended and the parts of the government that are now closed are reopened, there will not be a joint concurrent resolution brought up, let alone passed, in the House of Representatives inviting the President to deliver the State of the Union address. The President needs to come to terms with a simple reality: he is not in control over this matter. Speaker Pelosi is both smarter than he is and a strategic thinker, which he isn’t. He has no power over her. And he has no power over the House of Representatives, provided it is is not being led by a figurative invertebrate, like Paul Ryan, who is afraid of mean presidential tweets, Gym Jordan, Mark Meadows, and the base of the Republican Party. While Senator McConnell may be willing to finish his project of transforming the Senate into a parliament subservient to the President as head of government provided the president is a Republican, Speaker Pelosi is not willing to do that with the House of Representatives. She is also not going to play the President’s games. She said no, she means no, and she has the ability, unlike the President’s other female targets and victims over the years, to actually enforce that no. Expect more and more presidential petulance punctuated by a temper tantrum or several as the shutdown drags on and that mean lady Speaker Pelosi continues to tell the President that he can’t have his ice cream (the State of the Union address) until he eats his vegetables (does his actual job and agrees to reopen the closed parts of the government) before this faux crisis created by Paul Ryan’s weakness and the President’s petulance actually leads to a real one. This post is in All Too Normal, America, Domestic Affairs, Election 2016, Election 2020, Foreign Affairs, I'm With Her, Immigration, Open Thread, Politics, Popular Culture, Post-racial America and has 209 Comments. by Adam L Silvermanat12:09 pm on January 3, 2019 . It has 392 Comments. This post is in America, Domestic Affairs, Election 2018, Foreign Affairs, I'm With Her, Open Thread, Politics, Popular Culture, Post-racial America and has 392 Comments. by Anne Laurieat9:07 pm on January 2, 2019 . It has 270 Comments. Warren making a 2020 run is brave considering the only female candidate who has any chance at the White House is Yes, I'd Vote For a Woman, Just Not That One. I refuse to engage in any conversations about the likeability of women running for President in 2020. If all women political analysts did that it would make the misogyny more obvious as unlikeable men are left to wax poetic about women’s personalities ignoring their policies. When Elizabeth first decided to run for the Senate in 2012, she ran against a Republican senator who had a 65% approval rating, $10 million in the bank, and a cool pick-up truck…in a state that had never in its history elected a woman senator or governor. So we’re used to the tired, beard-stroking opinion pieces masquerading as smart political analysis. We’re used to being compared to any woman who’s ever lost an election, and we’re used to the anonymous, angsty quotes from “concerned” insiders, and the she-can-never-win garbage churned out by the Republican propaganda machine and recycled by the media. This post is in DC Press Corpse, Election 2020, Excellent Links, I'm With Her, Open Thread, Sen. Elizabeth Warren Is My Idol and has 270 Comments. Open Thread: Elizabeth Warren for President(ial Candidate)! by Anne Laurieat11:44 pm on January 1, 2019 . It has 117 Comments. I'm very happy that she announced. First, it's good that she's running, she is one of the good guys. Second, she is going to eat a lot of Sanders support and I'm very petty when it comes to Bernie Sanders. I’m selfish enough that I’d love to keep Warren as my own personal Senator, yet I’d be perfectly happy to see her in the Oval Office (and not just because we’d all be happy to see any Democrat in the Oval Office, considering the current squatter). But it’s not a small thing that every minute the Cosplay Socialists and their MAGAt playmates and the Media Horse-Race Touts spend attacking Warren — Pocahontas! Schoolmarm! Fumbling! SKREEEE! — is a minute they’re not targeting Kamala Harris / Kristen Gillibrand / Amy Klobuchar / Beto O’Rourke / AnyOtherDemocraticCandidate. I wasn’t 100% convinced about her potential candidacy until I attended one of her (many) town halls last fall; she’s damned impressive in person, and I suspect a lot of the Savvy Cultists are gonna be unpleasantly surprised at how many primary voters aren’t impressed by their ‘wisdom’ regarding her. Here is a tip — all of the stuff about Senator Professor Warren being “aloof” is based on her not stopping to give useless quotes outside the Senate chambers. Warren's 2020 launch video is genuinely interesting because it offers Dems something they have not nominated in ages: A nominee who identifies specific sources of trouble and will fight them, instead of suggesting that a good politician can get everyone to work together. Anecdotally I do still find a lot of Dem primary voters worrying that a "divisive" nominee can't win, so clearly there's some partisan asymmetry here. GOP voters seem to be all in on the "own the libs" strategy. Asked if super PACs should have role in this race, Warren says: "I don’t think we ought to be running campaigns that are funded by billionaires, whether it goes through super PACs or their own money that they’re spending." Warren betting on an avalanche of small-dollar online donations by announcing today, an otherwise huge fundraising day in the advocacy world. Will be interesting to see what that total number is and how early in the day they can tout an impressive one. This post is in Daydream Believers, Election 2020, I'm With Her, Open Thread, Proud to Be A Democrat, Sen. Elizabeth Warren Is My Idol and has 117 Comments. https://www.balloon-juice.com/wp-content/uploads/2015/11/balloon_juice_header_logo_grey.jpg 0 0 Anne Laurie https://www.balloon-juice.com/wp-content/uploads/2015/11/balloon_juice_header_logo_grey.jpg Anne Laurie2019-01-01 23:44:472019-01-01 23:44:47Open Thread: Elizabeth Warren for President(ial Candidate)! by Anne Laurieat5:23 pm on January 1, 2019 . It has 94 Comments. Pelosi was in the president’s seat. Loved it. Trump hates the arts. Never trust someone who hates the arts. This post is in All we want is life beyond the thunderdome, I'm With Her, Music, NANCY SMASH!, Open Thread and has 94 Comments.